Whales and penguins were in our rearview mirror, and so too was Puerto Madryn. It was an excellent start to our Patagonian leg of our journey, but we still had farther to go. Much farther. Despite the penguins, we had yet to feel like we had reached the end of the world. We wanted snow-capped mountains, glaciers, and areas even more remote. So we set our sights on El Calafate, near Argentina’s southern tip. To get there would be a bit of a headache, but we would avoid another 20+ hour bus ride, and at half the price no less! Instead, we took a five-hour overnight bus to the seaside town of Comodoro Rivadavia, and then hopped on a smallish prop plane to complete our journey south. Joining us, inadvertently, was “Our Danish Couple,” two Danes we met in our hostel in Puerto Madryn, who just so happened to be going the same way as us. Before heading to the bus station, they took us by a restaurant and shared their favorite local dish—delicious cheese and cream covered scallops. We, in turn, shared some of our red wine once we were on the bus. They were friendly, had interesting stories from their travels so far, and best of all, they accommodated a stupid, non-Danish-speaking American like me with English for most of our trip. We parted ways in El Calafate, right outside of our hostel. We said our goodbyes, and I was told to take good care of Christine (an order I hope to follow well). The city of El Calafate was definitely not what I had expected. The town was certainly isolated, and the snow-capped vistas were amazing, but it also had benefitted greatly from the influx of tourists. As is the case with many tourist towns, everything was expensive in El Calafate. The nearby Parque Nacional Los Glaciares, contains one of the few advancing glaciers left in the world, the massive Glaciar Perito Moreno. It would have been a sight to see, but the prices in El Calafate were exorbitant. 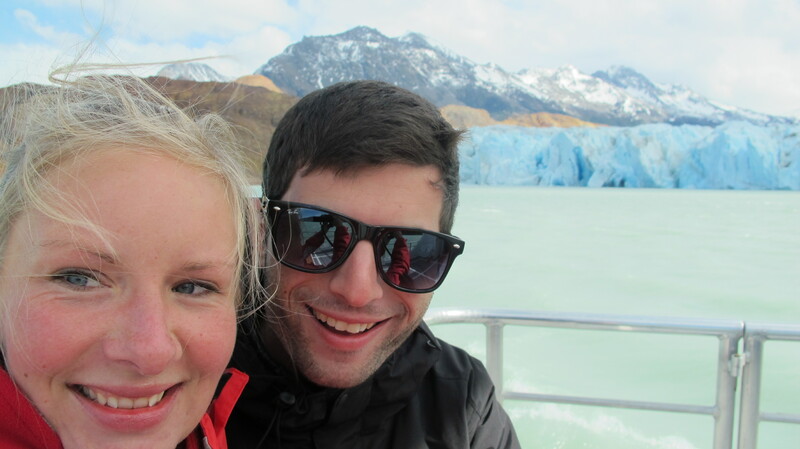 Instead, we decided to see what we could around the city for free, and then go up the road to El Chalten, about three hours away, to see a different glacier. NOT PHOTOSHOPPED! Inside Parque Nacional Los Glaciares, near El Chalten. El Chalten was much more along the lines of what I expected from the other El. It had a rustic feel, and the visitors to this more remote locale were there to do some quality hiking. 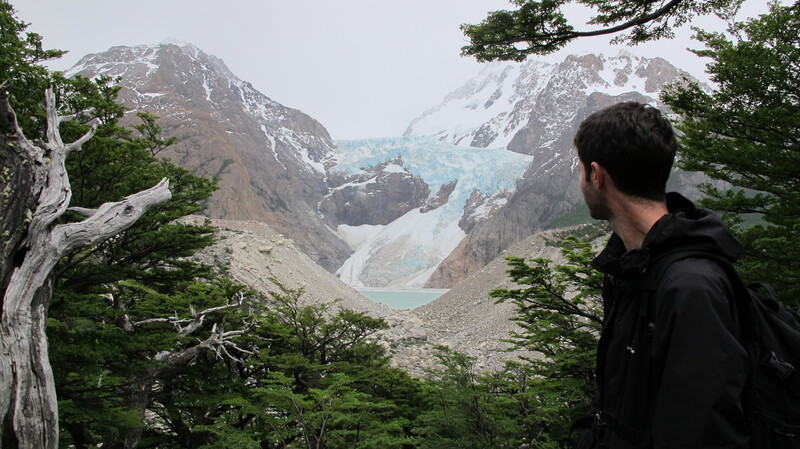 Unlike El Calafate, there was no entrance fee into the park, so we could come and go as we pleased, and we did, on two excellent day hikes, the latter of which included a magnificent view of an old, retreating glacier, followed by five hours of pouring rain. 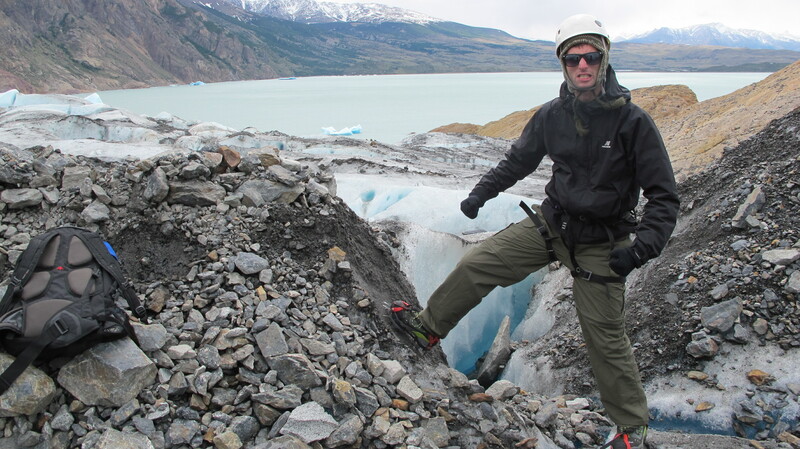 Another benefit of being in the smaller town was the availability of better-value tours on the glaciers. Christine had been dead-set on climbing a glacier. No, not merely walking around, but putting on some crampons and swinging ice axes and climbing it. We searched, and searched, and searched and yet no agency was offering that service. I tried to gently talk her down from the idea, but she would have none of it. If anything, Christine is persistent. Her stubbornness is duly renowned, and it can be equal parts charming and frustrating (often depending on results). We had just about given up and were in the bus station to book tickets for El Chalten when Christine’s eyes lit up, her arm shot forward, she pointed straight at the picture on the wall, and asked a woman in a booth, “Where can we do that? !” We had our answer, and instead of buying bus tickets, we were racing toward the tour agency. While expensive, the tour we booked was a great deal for the money. 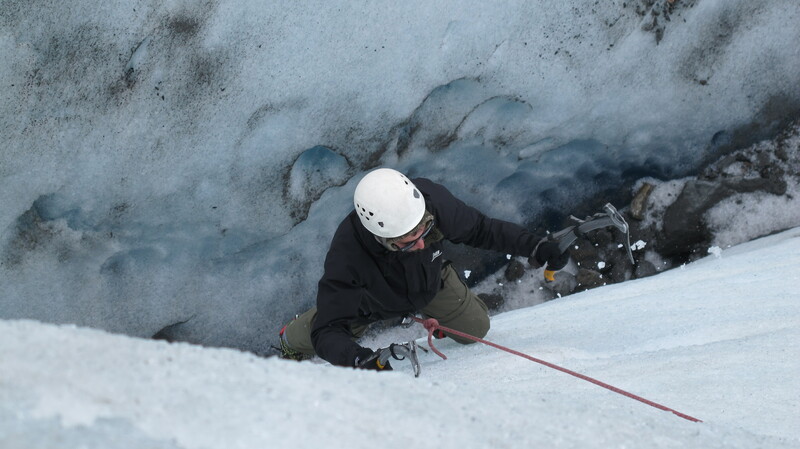 Many of the tours offered merely walking around a glacier for an hour or so, whereas ours offered a full day on the ice, with a boat ride to and from the glacier, ice climbing, and finally trekking on the glacier in the afternoon. Futhermore, since the tour left from El Chalten and not El Calafate, we would not have to pay the expensive park entrance fee. A couple of days later, we woke up early and eager (while perhaps annoying an older Japanese couple who shared our room). We boarded the bus, took the short ride to the ferry, and then made our way through beautiful, light blue, glacial waters en route to our destination. Despite fighting surprising large waves (for a lake) and a stiff headwind, the ferry made a slow pass down the face of the glacier. Tourists, ourselves included, uneasily found our way onto the deck to fight the winds and take a few quick pictures. I could have stayed and watched the glacier for hours, but instead we only stayed for a few moments before making our way past recently-created icebergs, and on to the docking area. We were split in two groups, a large one that did not include the ice climbing, and ours, consisting of only six people, which did. We were led to a permanent domed tent where we stepped into our climbing harnesses, and listened to a short introduction from our guide. Christine, somewhere beneath all that gear. Our group stepped out into the cold, cloudy, and windy day to make the short hike to the glacier. The red-brown rocks had all been scarred from years of glacial erosion, leaving behind long, dark, smooth streaks on the surface. Our guide explained how only 25 years ago, the glacier was advancing where we now stood. Only a quarter of a century ago, there would be over 50 meters of solid ice where we now stood. The retreat of the glacier, a sad and common occurrence the world over, was steady and predicable. Our guide would point to spots along the route, “The glacier ended here two years ago,” and so on. After approximately 15 minutes, we made our way to the edge of the glacier, and our guides helped us put on our crampons. 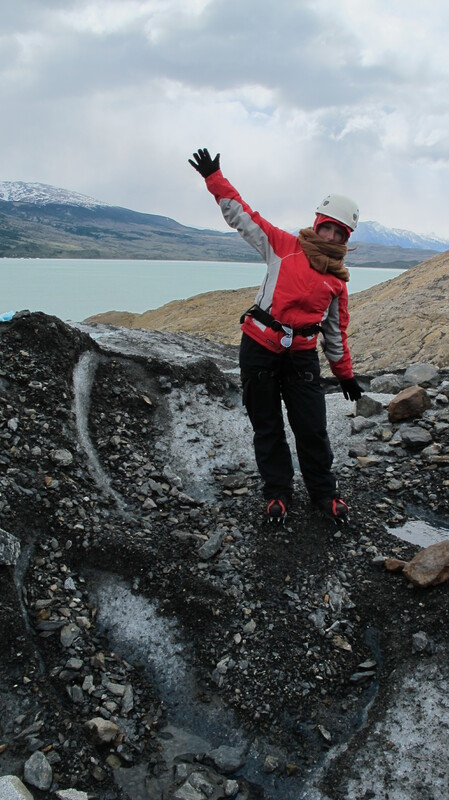 Now fully equipped with helmets, harnesses, and crampons, we took our first awkward steps out on the glacier, and made our way to a decent climbing point. Two striking things stood out most about walking on a glacier: the extraordinary shade of blue, and the dirt. From a distance, the glacier appears a magical sort of whitish-blue, and from up close that blue is even more prominent. 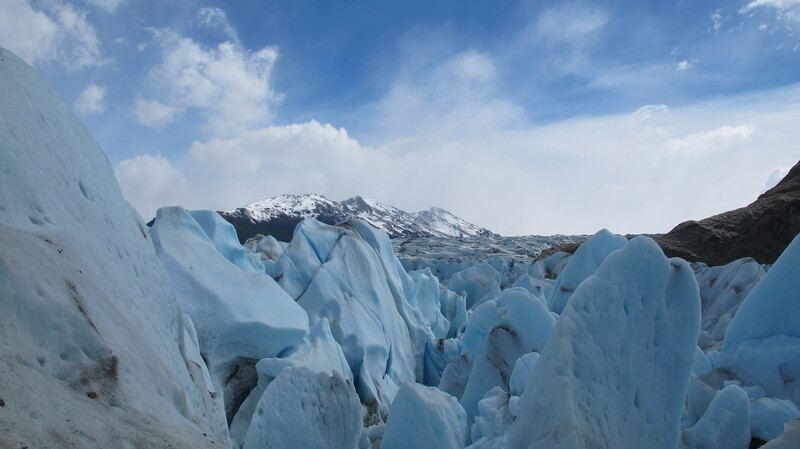 The blueness of the glacier cannot be exaggerated, it simply looks unreal, as if it was painted on by the Argentina Tourism Board. In stark contrast to the unworldly blue, the top of the glacier more closely resembles a giant field of rocks and dirt than of a river of ice. I understand the scientific principle behind this: glacier picks up rock, ice melts, rock doesn’t, rock sits on ice. But seeing it first-hand was still a bit unexpected and strange. Soon, we arrived at a wall of ice that our instructors deemed suitable to climb. We were given a brief lesson by one, while the other climbed up the hill (with considerable ease and sans ice axes), to secure the rope for our climb. Ice climbing for the uninitiated such as Christine and me was not as simple as our guide had made it look. I tried to follow her instructions the best I could, but everything felt wrong. My crampons felt as if they would slip out from under me at any moment (and several times they did), and I never managed to get my legs or hips in the “proper” position, as the woman had just instructed moments ago, but somehow, I slowly made it to the top. We went on two climbs, the second was much more difficult than the first. The climb was exhilarating, though not something I would want to do on a regular basis. Cold, wet, tired, but feeling an air of joy from completing our climbs, we wound our way back to our tent for some lunch, before setting back out for another stroll on the glacier. There would be no more climbing in the afternoon, but the ice trek was equally exciting. The sun came out near the end of the day, and the sights were incredible. Finally, our guide presented us with a surprise, a bottle of Baileys to share, chilled in fresh, glacial ice. From there, it was back down the river of ice, a short walk to the waiting boat, and a ride across the chilly, blue glacial lake. The sunshine and sense of accomplishment left us feeling elated, but El Chalten had one last surprise for us. As our bus back to town rumbled down the road, the clouds continued to part, revealing for the first and last time during our stay, the majestic Fitz Roy Mountain. Christine and I shared a smile and then refocused our attention on the famous peak and just took it all in.